Purchase your position in the show above. There will be one Spokesperson and one Public Relations per show and no more than two Sponsors & Donors. Once twelve positions have filled, this page will be removed and the price will increase by several hundred dollars. 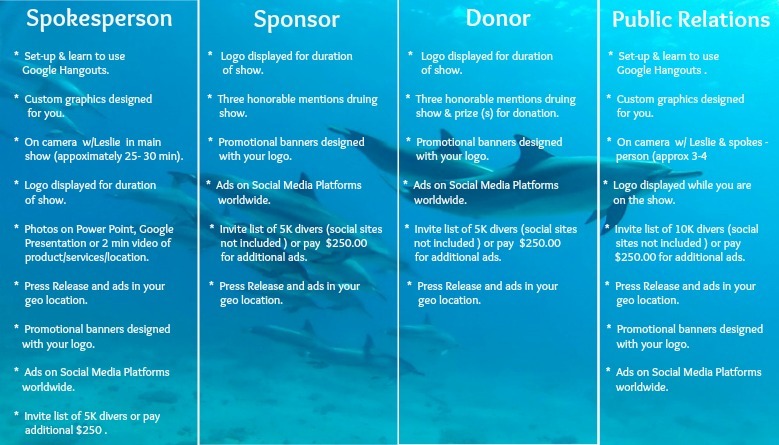 Spokesperson, Sponsor & Donor are required to invite no less than 5,000 divers via email. The Public Relation position must invite 10,000 divers. if you do not have the required amount or you do not want to invite your list, no problem. You will need to purchase the additional ads here instead. Failing to do this would result in disqualification with no refund. We look forward to a fun and fabulous show! If you are unable to join us, we would like to understand what we could do to make this work for you. The cost is extremely low and affordable for the amount of press and exposure you receive in return. There is one other option for those that want exposure yet cannot afford these prices. You will not receive the numbers of viewers like the show will bring, but you will receive much more exposure than you have now. These Google Hangouts are for divers and smaller businesses leading up to the show. Be on a Google Hangout with Leslie and tell us all about your product, service or location. This price includes two lessons with Leslie; she will teach you how to use Google Hangouts, camera, microphone, ear-buds, lighting, lower thirds, etc..
Once you’ve taken this mini-course, you will prepare for future Hangouts at no cost.